Nasi Goreng Pattaya is a Malaysian street food, name after Pattaya in Thailand but has nothing to do with Thai, a similar story like Singapore fried rice vermicelli. 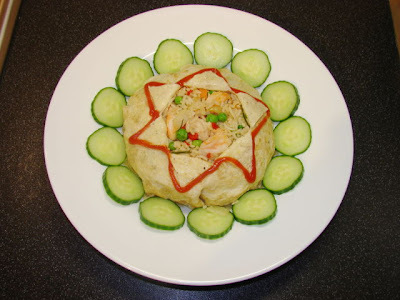 This is a Thai flavoured fried rice with an omelette blanket. Serve with tomato ketchup or chilli sauce over the omelette and cucumber on the side. Add oil in pan, fry the garlic and onion, then add the lemongrass and carrot, fry till carrot is slightly softened. Add curry paste and rice, stir till mixed and fragrant. Then add enough fish sauce and soy sauce to taste. 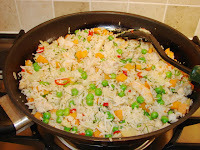 Then add peas, chicken, prawn, lime leaves and chillies, stir till very hot. Take the rice out. Fill rice in a bowl (like a cereal bowl), pack it down a bit. Tip this rice with the bowl on, onto a serving plate. Leave the bowl on to keep the rice warm. Then make the omelette, thin as you can and must be big enough to completely cover the rice, careful not to break it. Take the bowl off the rice you will get a bowl shape rice, slide the omelette careful over the rice, tuck the excess under the rice. Drizzle with tomato ketchup/ chilli sauce and few cucumber slices on the side. Ready to eat. For the photo I have cut the middle of the omelette to show the rice inside, normally this is just a rustic street food, no pretty deco.